1. First soak the sea lettuce in cold water and leave to rehydrate for 30 mins. 2. In the meantime wash the other plants and drain. Using a vegetable peeler make long fine ribbons from the squash add these to a mixing bowl. 3. 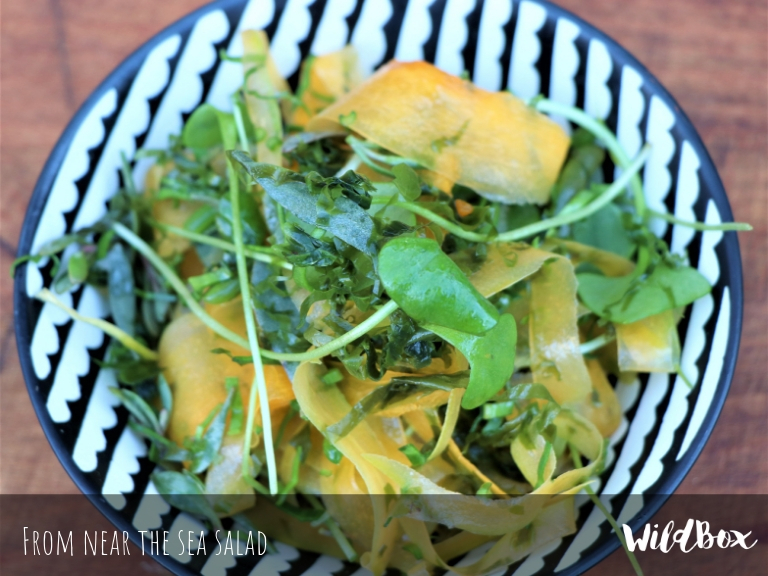 Pick the leaves from the purple dew and the sea purslane and add these to the bowl. 4. Finely slice the young sea aster, squeeze any excess water from the sea lettuce and finely shred this too, combine with the aster, the spring beauty and the other ingredients. 5. Make a simple tahini dressing by mixing the tahini, lemon juice, olive oil and seasonings in a separate bowl, let it out with a couple of tablespoons of water to achieve a lighter consistency. 6. Dress the salad and gently mix all the ingredients together.